We have made hummus years ago, and failed in our attempt to duplicate the smooth and creamy texture found at our favorite middle-eastern restaurant. Last night I accomplished the great task of making some of the best hummus we have ever tasted. 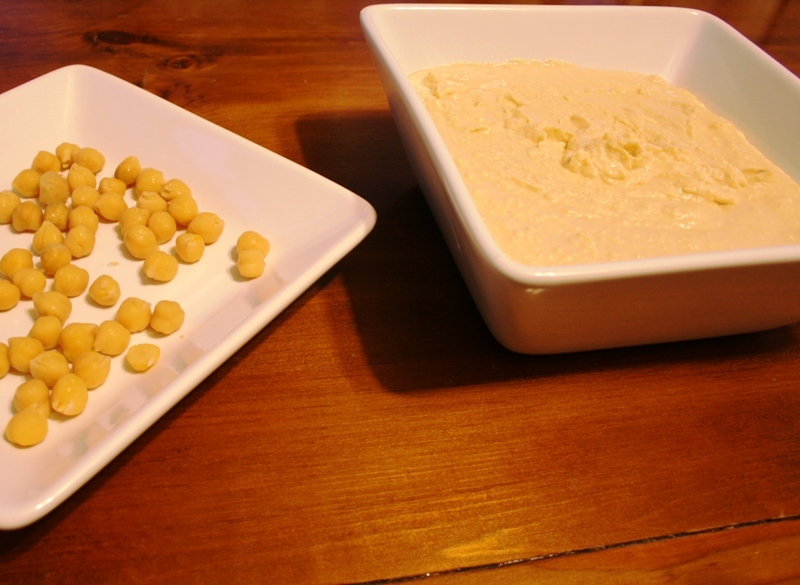 Along with some warmed flat or pita bread, or fresh raw vegetables, this hummus is a wonderful dip for any occasion. For years we have bought hummus in the stores, paying good money too for a cup or two, upwards of $4 – $5, now you can make your own and save lots of money, and at less than half what it costs on the shelves. A pound of dried garbanzo beans at $1.49, a container of tahini at $3.50, and the other ingredients are less than a dollar. We used three cups, or about half of the cooked garbanzos and only three tablespoons of the tahini. The cost for our three cup yield was most likely about a dollar. Adapted from the ETL book and found on page 211, here is our modified recipe for hummus. The original recipe calls for cooked or canned garbanzo beans, I prefer to cook them from dried form, because they are much fresher. Also, soaking them overnight speeds up the cooking time, but there is another great bit of information that Dr. Fuhrman mentions in his book. When you soak beans, with the excpetion of lentils, they start to go into a pre-germination state that released more nutrients, and they seem to “come alive” with life giving properties. Just remember to drain the soaking water from the beans, then refresh with new water before cooking. I used cool filtered water to both soak and then cook the garbanzo beans. Just cover the beans with a couple inches of water and bring to a boil, then simmer for about 2 hours. Another tip, when I blended this together the garbanzo beans were still quite warm from the cooking and draining, I think this helped with them getting smoother in the blender. 1. Put all the ingredients into the bowl of a blender and process until smooth and creamy. This recipe was prepared on Eat To Live, Week 1 Day 3, and linked from Eat To Live, Week 1 Day 4 of our ETL diet, you can follow our progress at Eat To Live. Ryan, you are convincing me I need to get this book. I love the info you give us (IE: the dried chickpea nutritents!). Oh wow, I had no idea that soaking the beans makes them release more nutrients! What a good tip. Great lookin’ recipe! I love hummus. It is SO much less expensive than pre-made and it always tastes better! Hummus is a wonderfully delicious and new experience for me. This one sound superb! This will get you some more traffic, I guarantee it, plus I have the recipe I am making later today! I know you and I can make a wonderful Team here!